A well-known crisis litigator, Los Angeles-based Freedman received national press attention for extracting Megyn Kelly from NBC Television following the newsoman’s on-air blackface comments, reportedly getting her hefty contract paid in full. He also settled employment termination lawsuits for Paramount executives Megan Colligan and Amy Powell. 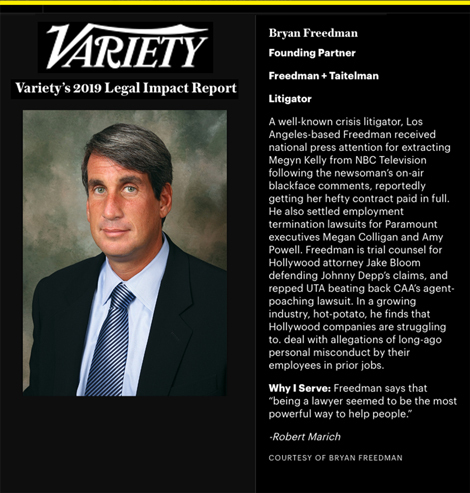 Freedman is trial counsel for Hollywood attorney Jake Bloom defending Johnny Depp’s claims, and repped UTA beating back CAA’s agent-poaching lawsuit. In a growing industry, hot-potato, he finds that Hollywood companies are struggling to. deal with allegations of long-ago personal misconduct by their employees in prior jobs.